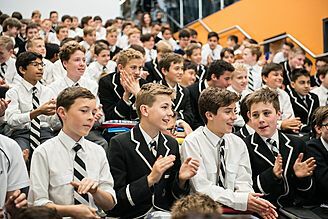 Newington College educates boys from K-12 across three campuses, attracting students from throughout the Sydney metropolitan and regional areas, the Asia Pacific and beyond. Situated on 25 acres of gardens and playing fields, Newington College is a spacious oasis of learning in the heart of an expanding international city — only ten minutes from Sydney International Airport and Central Station and five minutes from the University of Sydney. Newington is committed to providing students with an internationally respected education in an environment where they have access to the best teachers, facilities and opportunities. 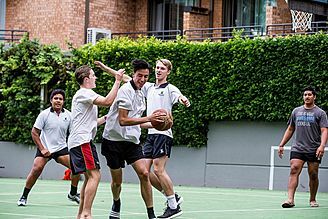 In keeping with the IB’s philosophy, boys at Newington are encouraged to develop a broad understanding of the world and to immerse themselves in their own particular areas of interest. They are encouraged to approach their education with an openness to diverse views and perspectives. Newington’s five pillars of distinction describe the learning priorities that make up a holistic Newington education — learning and teaching; well-being, character and service; spirituality, values and ethics; co-curricular engagement and community in partnership. Newington’s International Baccalaureate programme for boys is unparalleled. 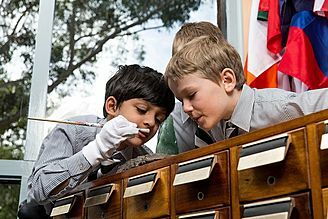 The Lindfield Preparatory school offers the Primary Years Programme and the Senior School is the only Greater Public School in Sydney that offers a choice between the state-wide Higher School Certificate and the IB Diploma Programme. The IB Diploma at Newington is growing rapidly in popularity. In 2017, 28.5% of the graduating boys have chosen to complete the IB Diploma. The College is equipped with subject specific, industry level facilities. 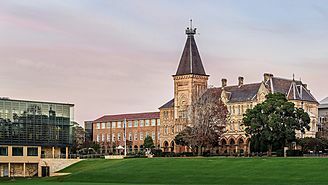 Newington College opened in 1863 with a liberal policy of inclusion that declared the College, ‘open to the sons of all’. An exceptionally strong sense of community is part of the Newington culture, which emphasises service to others, a liberal outlook and the development of strong and lasting relationships. The College is committed to ensuring that each member of the school community feels welcomed, respected and valued. As a Uniting Church school, Christian values shape the way that the College builds its community and provides education to students. This includes welcoming students and families of all faiths and cultural backgrounds. The boys develop a sense of social responsibility and justice through active community involvement. Newington College is committed to supporting and encouraging all boys to discover their passions through participating in a varied range of co-curricular activities. These opportunities constitute a great part of what distinguishes a school such as Newington College. Boys combine academic life with sports, arts, outdoor education and hands-on learning activities. Lindfield partners with the PYP to provide an education that is holistic, values-based and employs the latest best practice to ensure that boys learn how to engage critically and effectively with the world around them. The PYP provides a framework for addressing the NSW Board of Studies Syllabus with significant specialist learning experiences in Religious Education, Art, Music, Languages (Mandarin) and Health and Physical Education. The Transdiciplinary Themes that are key to the PYP provide the opportunity for teachers to incorporate local and global issues into the curriculum and to help students to look beyond the confines of each subject. Students undertake substantial, in-depth, long term inquiries that enhance and deepen their skills and understanding across a number of key learning areas. Some of the many benefits of partnering with the IB are access to excellent resources, the chance to connect with other schools around the world, diverse professional development opportunities offered to staff and ongoing support from consultants, conferences and access to the latest research. Giving senior boys choice in what they learn is an important part of helping them achieve their own academic success. Whether studying the NSW HSC or the IB Diploma, the aim to develop learners with independence, inquiry, and a global approach to learning is key to Newington’s tradition of diversity and student-centred learning. Delivered in over 4000 schools globally, the Diploma Programme provides pathways to Australian and overseas universities through encouraging broad study that balances rigorous and critical thinking with active citizenship and civic engagement. “The IB looks beyond high school and prepares you for university-style thinking and researching. This was challenging because it’s unlike anything else you do at school,” said Jeremi Campese (ON 2016) There are 3 key elements to understanding what an IB education means for Yr 11 and 12 students at Newington. 1. Students are at the centre of the learning process and are expected to develop a range of skills that enable them to take an active role in making decisions about their learning. 2. Teaching and learning is based on inquiry, focused on conceptual understanding, developed in local and global contexts, angled towards effective teamwork and collaboration, differentiated to meet the needs of all learners and informed by assessment. 3. Newington’s Diploma Programme is designed in a way that builds and reinforces key learning skills across all subject areas.